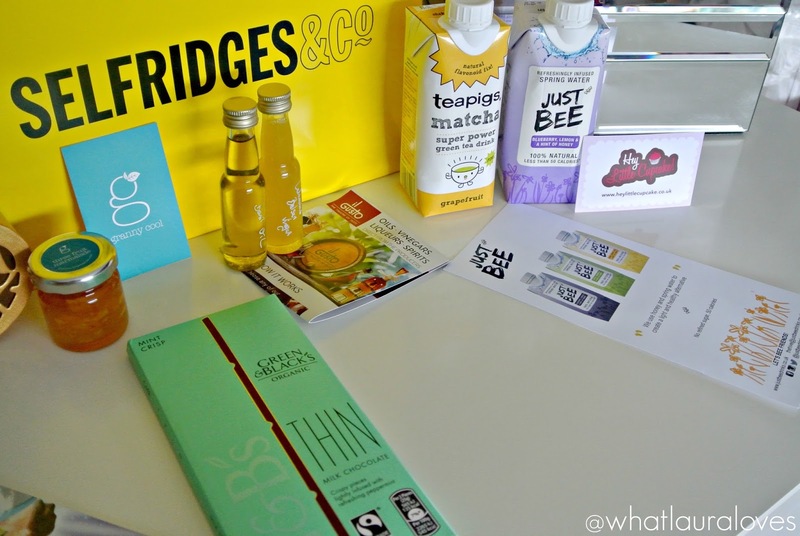 I recently received an exclusive invitation to attend the Selfridges Trafford AW Foodhall Event where, along with other bloggers and press, I would be treated to an evening of delicious food, live demos and exclusive workshops so that I could come back and tell you all what it was like and what is on offer in the store. 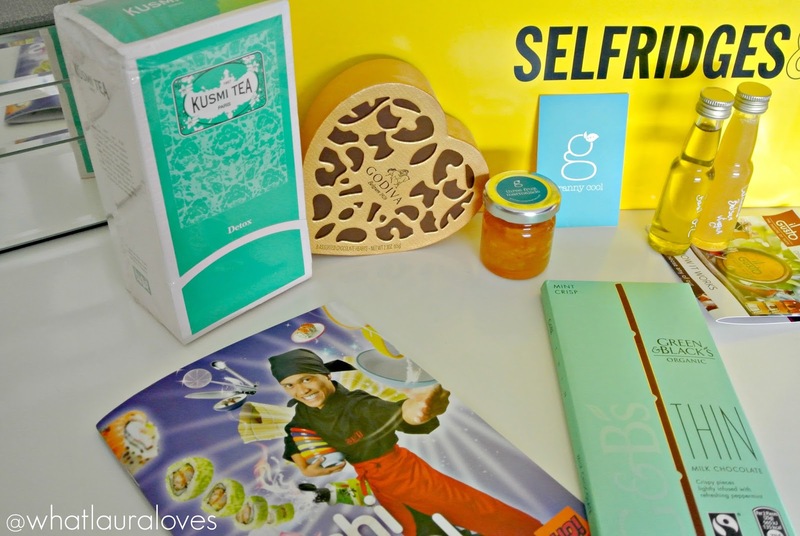 Given that Selfridges is one of my most favourite department stores for luxury shopping, I decided that it would be well worth the trip down to see what the evening had to offer and gosh, was I right! 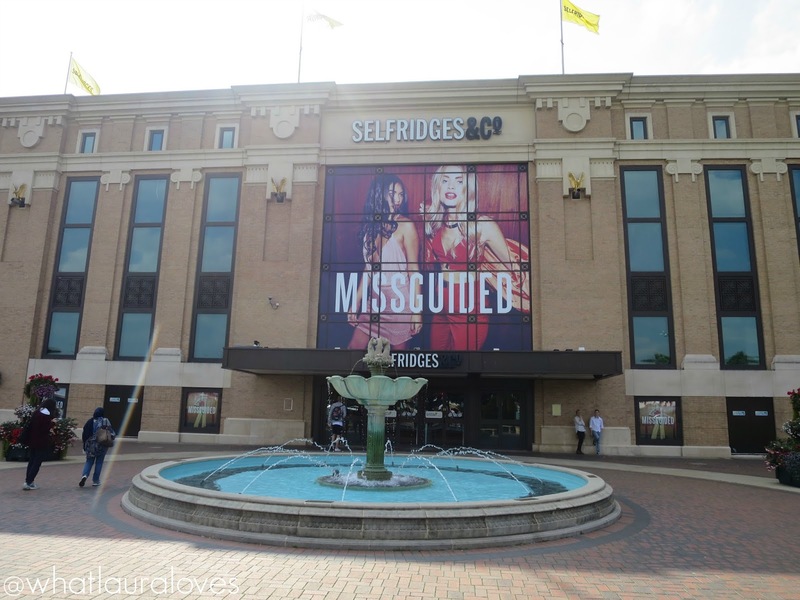 I’ve visited the Selfridges store at Exchange Square in Manchester many times before as that is my favourite of all of their department stores but visiting the Trafford Centre store was a first for me. There was a real buzz about the place and every department was alive with eager shoppers and happy to help sales associates. The Foodhall was easy to find, as it is situated on the first floor, right at the front of the store, facing out onto the Trafford Centre itself. The area is bright, spacious and well laid out so you can easily get an overview of where everything is located. There’s every food and drink imaginable available to buy to take home, along with a Pret A Manger and a Yo Sushi restaurant which is where we, as attendees, made our first stop. 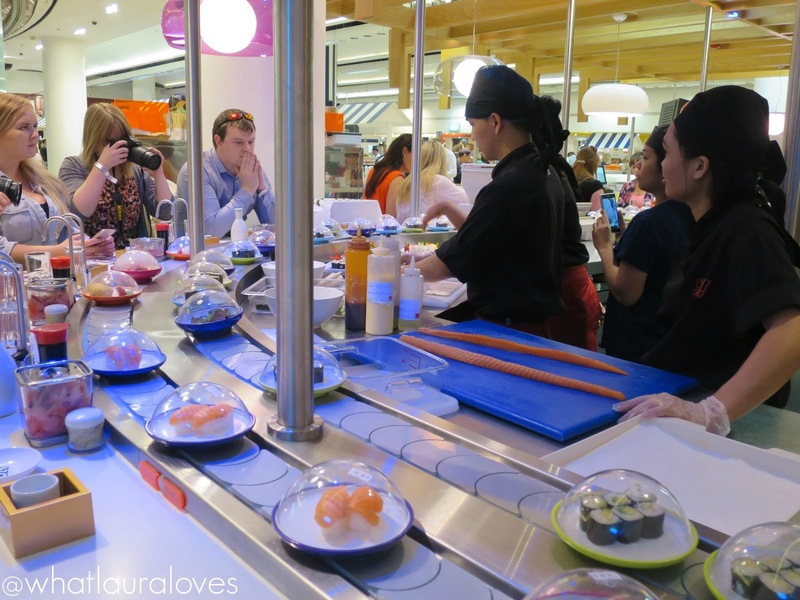 The Yo Sushi workshop was definitely one of the highlights of the evening because it well and truly pushed me out of my comfort zone to try something new. 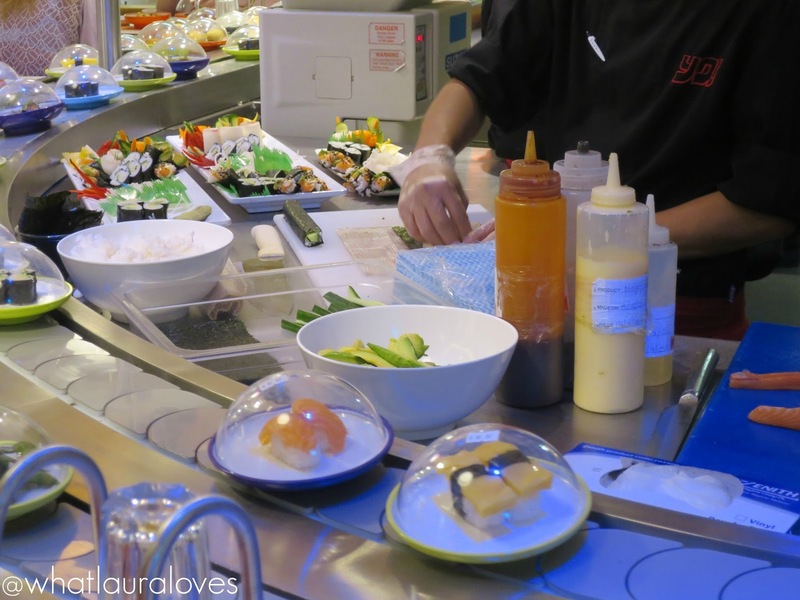 The expert chefs talked us through the menu, the sustainable fresh fish that they have delivered everyday and how they create their amazing looking sushi; it really is a work of art! 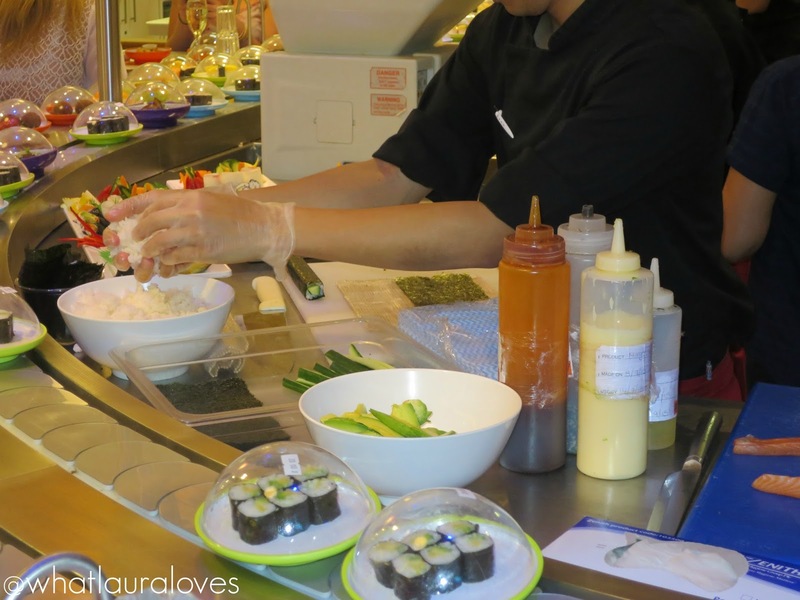 We were given so many different samples to try from the Kaiso Salad to the Cucumber Maki and Salmon Sashimi to my personal favourite, the Salmon and Avocado Hand Roll. 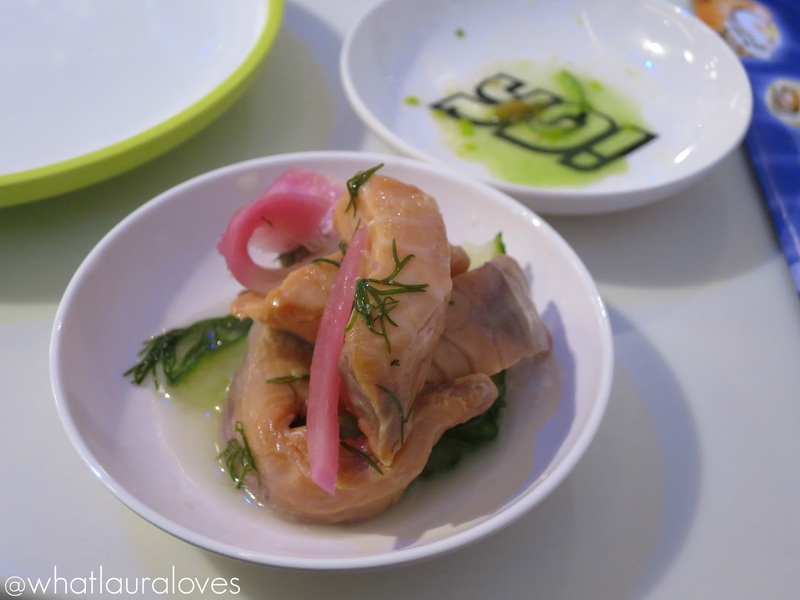 These are actually dishes that I would never have tried had I not been at the workshop as I usually opt for the hot dishes. 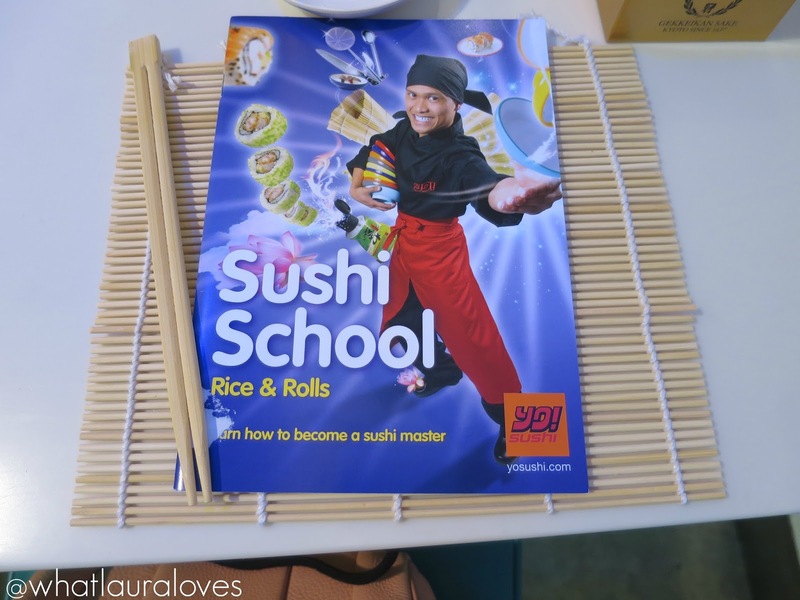 I’m so pleased that I got to try out lots of new ones to me because they were delicious and gave me the confidence to choose those options again at Yo Sushi in the future. I even got to taste Saki for the first time and was surprised that I quite liked it! 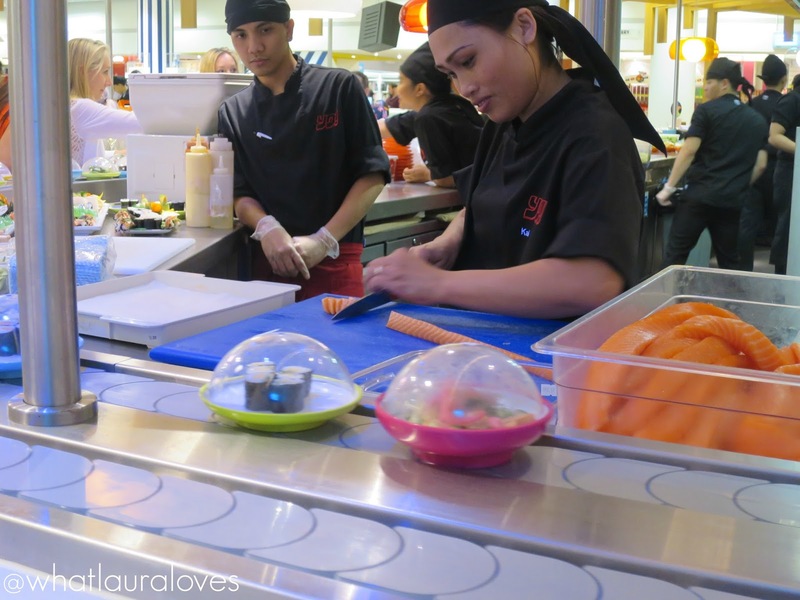 There’s plenty of seating available at Yo Sushi and it has a really relaxed, fun atmosphere which makes it a great place to head to after a day shopping. 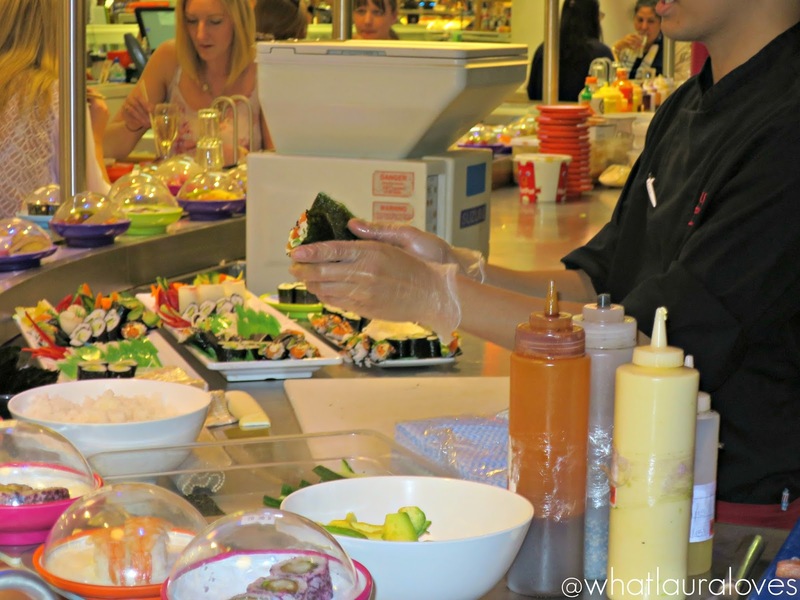 I like that the calories for each of the dishes along with the prices are clearly listed on the menu so you know exactly how much you’re spending and what the approximate calories are which is great for if you’re trying to be good… or saving your calories for another treat in the Selfridges Foodhall. I wouldn’t blame you as the choice is amazing! 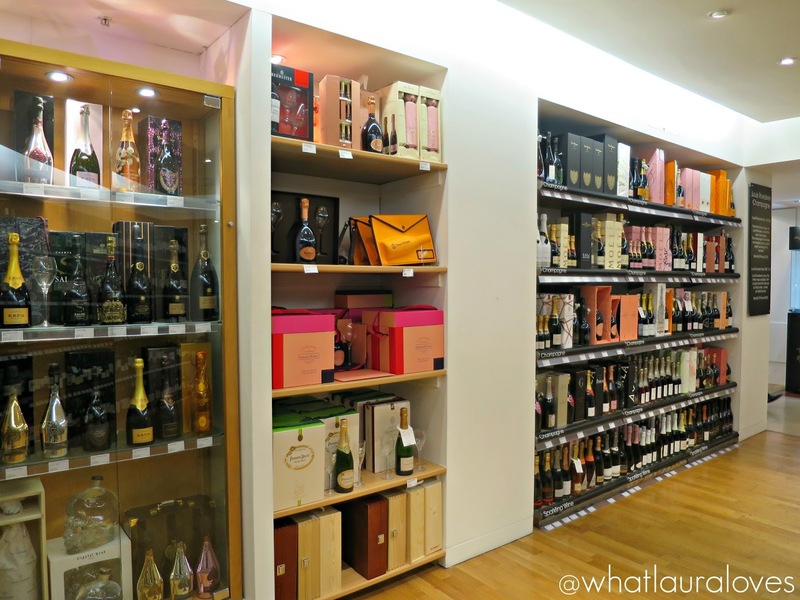 Whether you’d consider yourself a bit of a wine connoisseur or you’re completely clueless like I am as I rarely drink, the Selfridges Wine Shop is the place to head to for your alcoholic beverages. 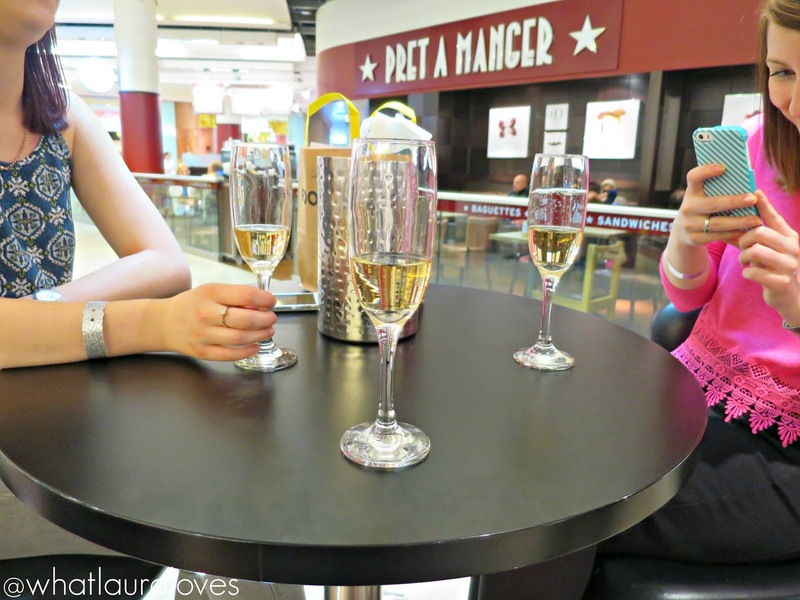 We enjoyed a wine and champagne tasting session where we sampled a Prosecco, Cava and a Champagne and I’ve got to say that I really learned a thing or two. When you actually take your time to properly taste a glass of bubbles rather than simply drinking it you can really notice the sometimes subtle, sometimes significant differences between them. Wine and champagne is always something I’ve struggled with buying in restaurants and as gifts in shops as I’ve never been too sure what I’m looking for and I have never really felt confident asking for help for fear of the assistant thinking that I’m a complete fool, so I tend to go for the brand names that I recognise such as Moët & Chandon or Veuve Clicquot if we’re going to a dinner party or having friends over, or Don Pérignon if we’re feeling a little flush and have something to celebrate. However the sommelier that ran our wine tasting at Selfridges was so incredibly knowledgeable yet very approachable at the same time which completely put me at ease to be able to ask as many questions as I could think of and I really felt as though I came away from the evening a little more educated in wine. The ability to be able to put someone at ease in an area that they may not feel well educated in is a great skill to have and everyone that I spoke to at the Selfridges Wine Shop was so helpful and knowledgeable about their products that I am very confident that they would be able to pick out the wines that would be best suited to your palette, the meal you’re perhaps going to be enjoying the wine with and the occasion that it is for. 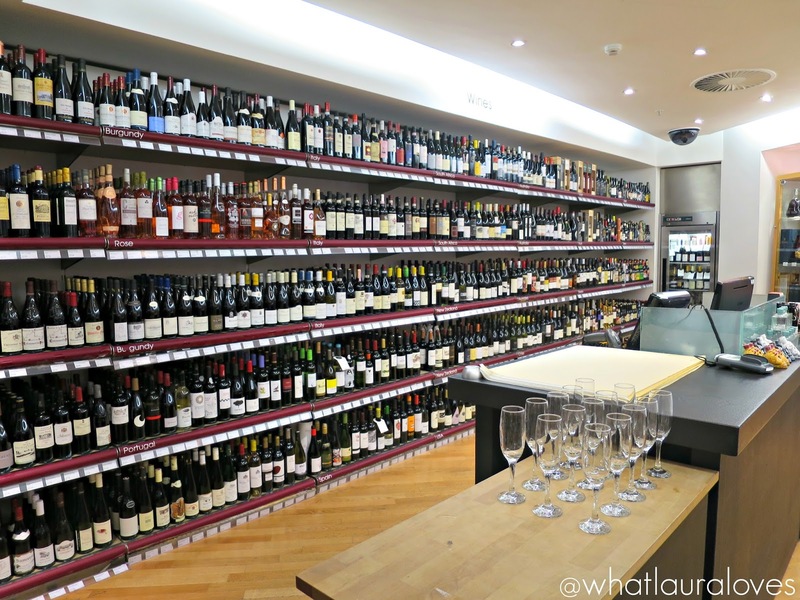 If you’re not someone who drinks wine too often, buying a bottle for yourself or someone else can be a daunting experience but the trained staff at Selfridges know how to choose the right wine at the right price for you. 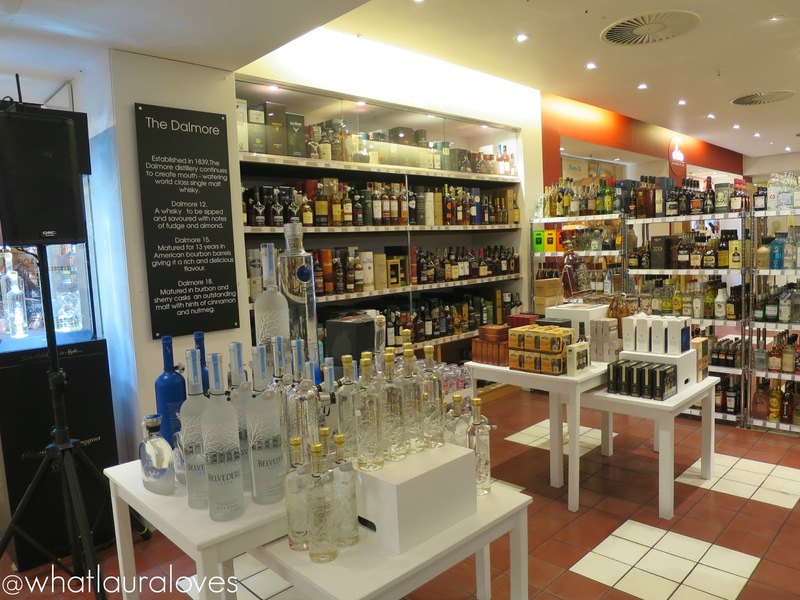 The also have a vast selection of superb spirits which is an area of the Selfridges Wine Shop that I have purchased from many times in the past when I have been staying in and around Manchester. Whether drinking alone, with a mixer or as a cocktail, I much prefer using high quality spirits so it is great to see such a varied selection in one place. 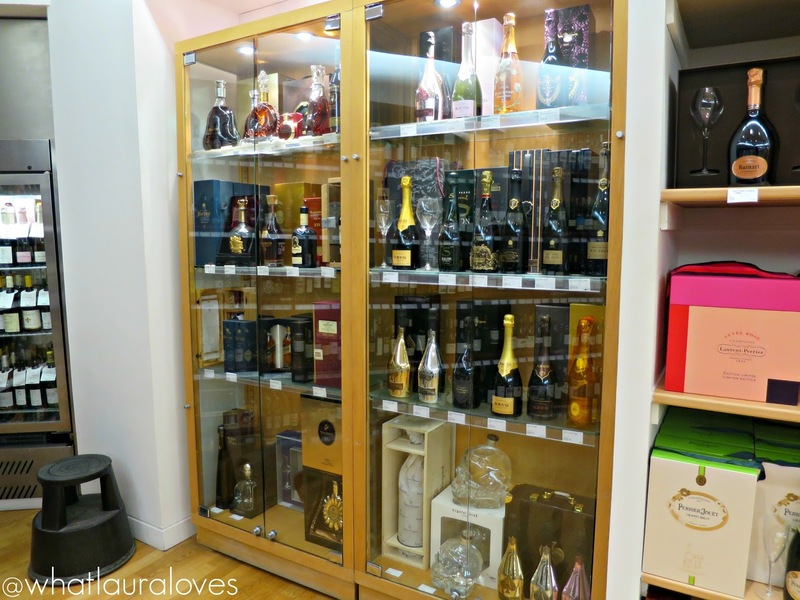 Being my fathers daughter, I did notice their wide range of well aged whiskeys too. My dad really appreciates a good whiskey, especially at Christmas time so when I head to Manchester later this month, I’m going to pop in to buy him a bottle. 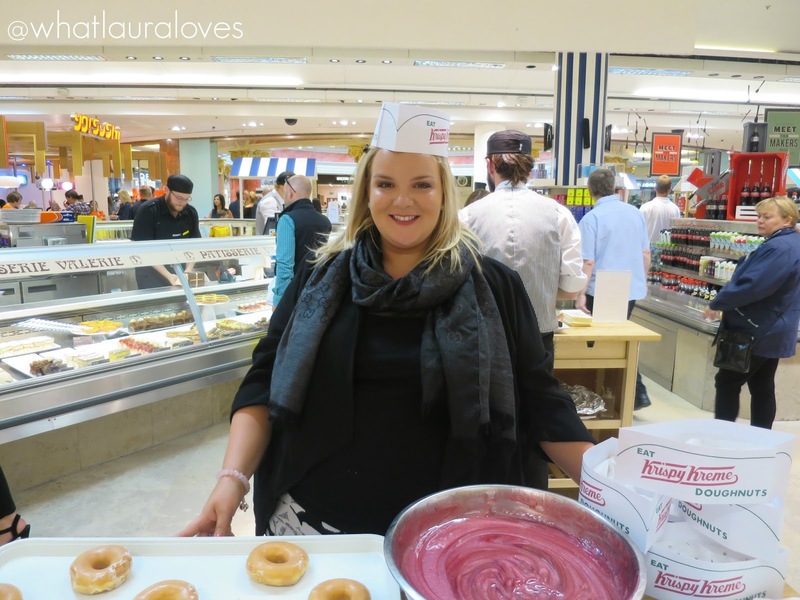 After the champagne tasting, I headed over to Krispy Kreme where, after posing in a rather fetching paper hat, I was able to dip my own doughnut to create a raspberry glazed doughnut which didn’t last very long at all as my dad got his hands on it as soon as I got in the car! 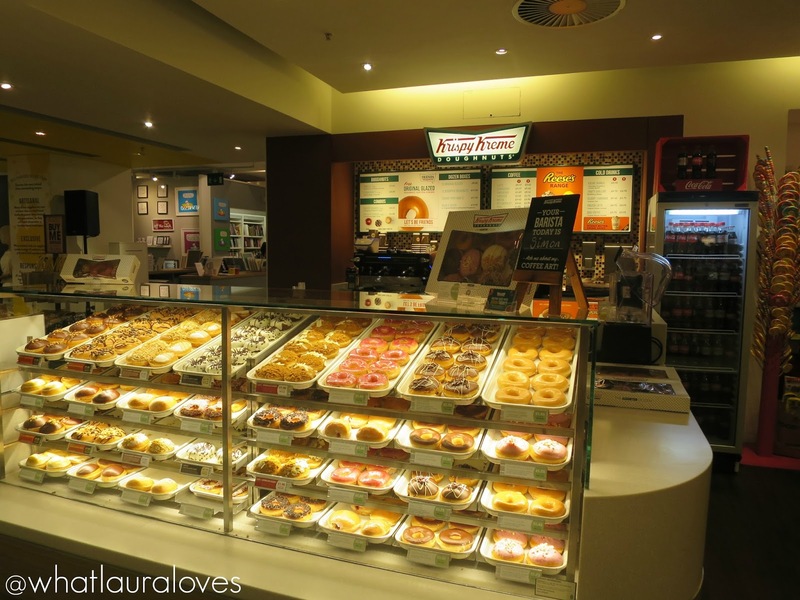 I’m more of a plain glazed doughnut fan myself but even I was tempted by the huge array or doughnuts on offer at Krispy Kreme. They have a huge counter with them all out on display so you can see all of the different flavours, whats in them and which ones are limited edition. You can guarantee that they’ll be fresh and full of flavour as they’re made fresh every single day. All of the Krispy Kreme doughnuts are available to buy on their own and you can buy as many as you like or you could buy them in a box of 3, 6 or a dozen so you can share them around your friends and family. I personally think that they’re great for parties, especially with the festive season coming up when you might be having people over to your house for drinks and nibbles. The fun didn’t stop there as after the Krispy Kreme stand, I visited Hey Little Cupcake! 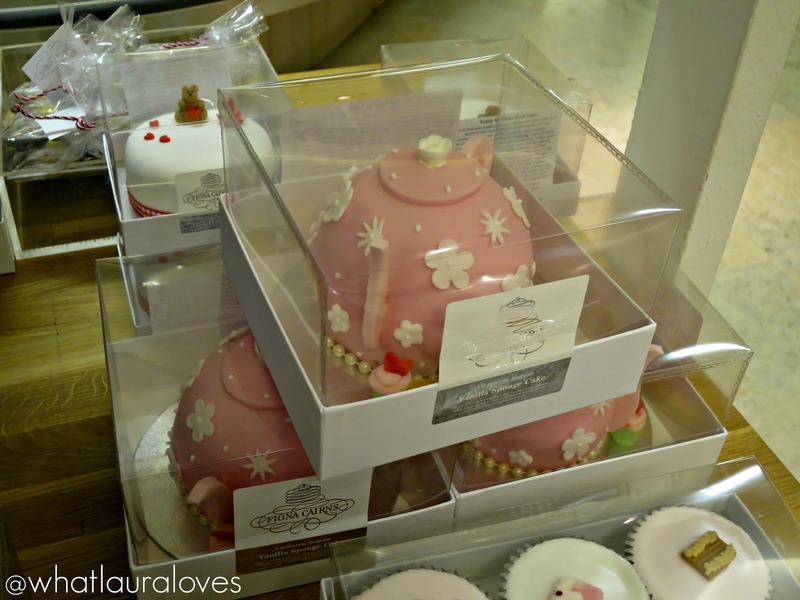 who are a Manchester based cake company selling a whole range of gorgeous baked delights. I got to decorate my own Cookie Monster cupcake which wasn’t too difficult to do, even though I hadn’t used a piping bag with icing before. Hey Little Cupcake! had so many beautifully decorated cupcakes that would be perfect for a party, giant cupcakes that would be ideal for a birthday and cake pops that would make fabulous party bag or wedding day favours. While I don’t think that I’ll be getting a job in their decorating department anytime soon, if you squint and look the other way, I don’t think my Cookie Monster looks too bad at all haha! Plus it tasted so delicious; soft, light and sweet. Hey Little Cupcake! also offer a really facility where they can print your photo onto a cake for you. They had selfie sticks there ready for you to take a cupcake selfie on and then printed it onto edible icing that was placed onto the top of a yummy cupcake. This is such a fun idea and would be great for if you’re buying a lot of cupcakes for a party or a business event where you wanted your company logo to be printed onto the cupcakes. 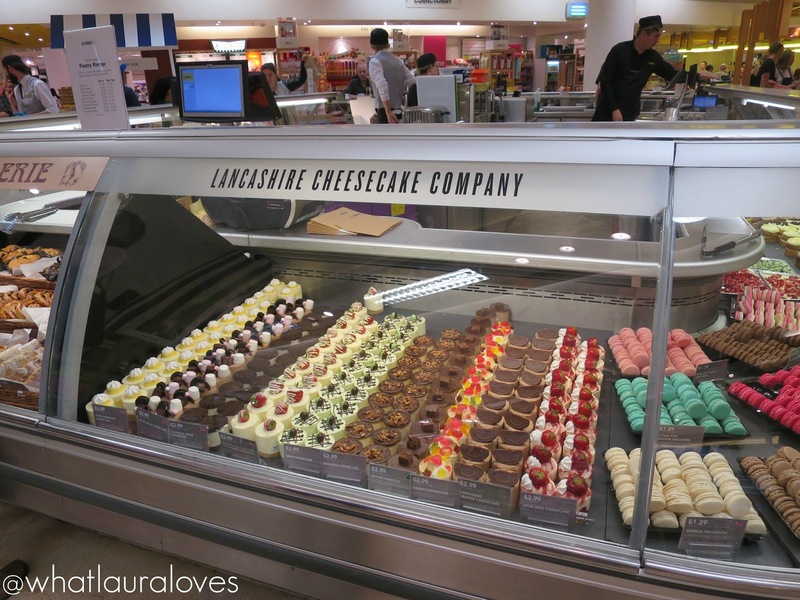 Another local company showcasing at the event was The Lancashire Cheesecake Company. They produce a range of delicious homemade cheesecakes that are incredibly fresh and full on authentic flavour as they’re free from artificial preservatives, colours, flavourings and thickeners. 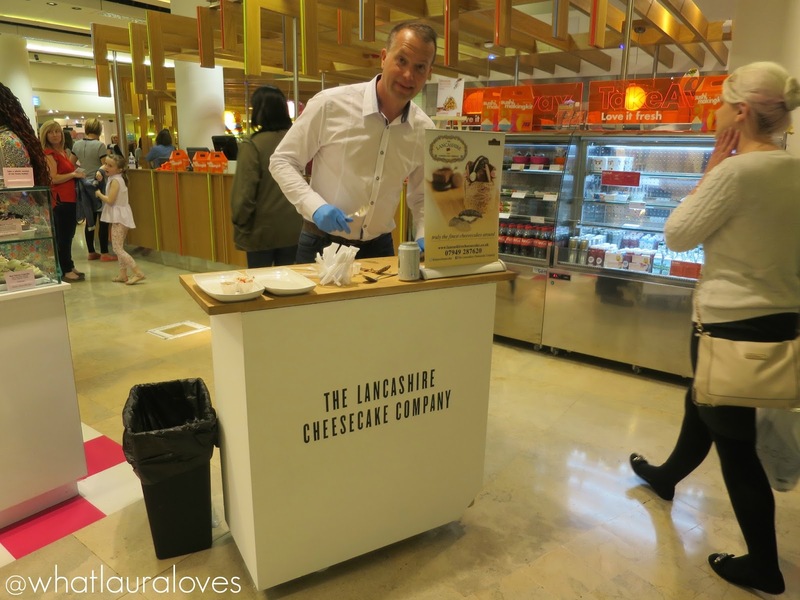 I sampled their cheesecakes while at the event and without a doubt, they were the best I’d ever had. I would highly recommend the Zesty Lemon Cheesecake which is made with their homemade lemon curd that tastes incredibly zingy and sweet! If you’re looking for a more traditionally decorated iced cake, Fiona Cairns had some beautiful ones on display. 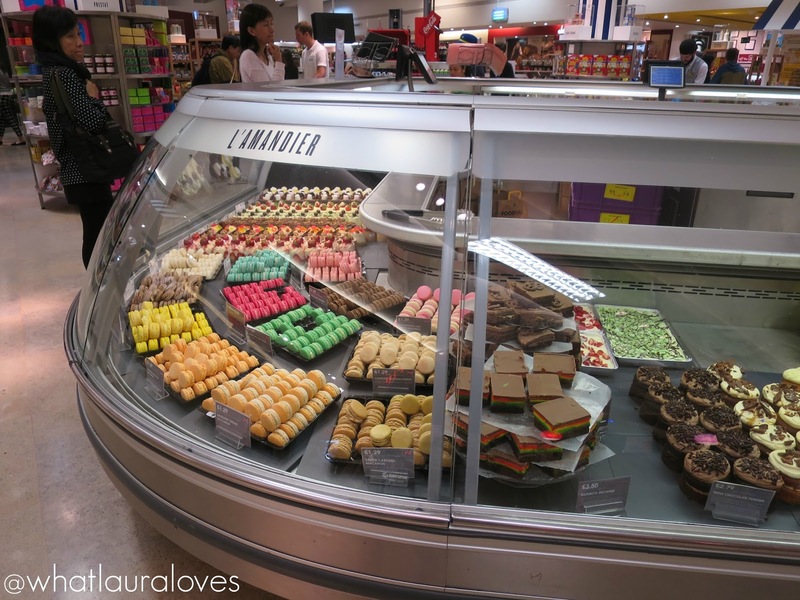 My favourite thing about the Selfridges Foodhall is that they really support upcoming artisans and local suppliers alongside some of the most famous names in food and their exclusive products from big name companies. It is so important for our economy to support local and small businesses and I really think that it is absolutely amazing that Selfridges do this. 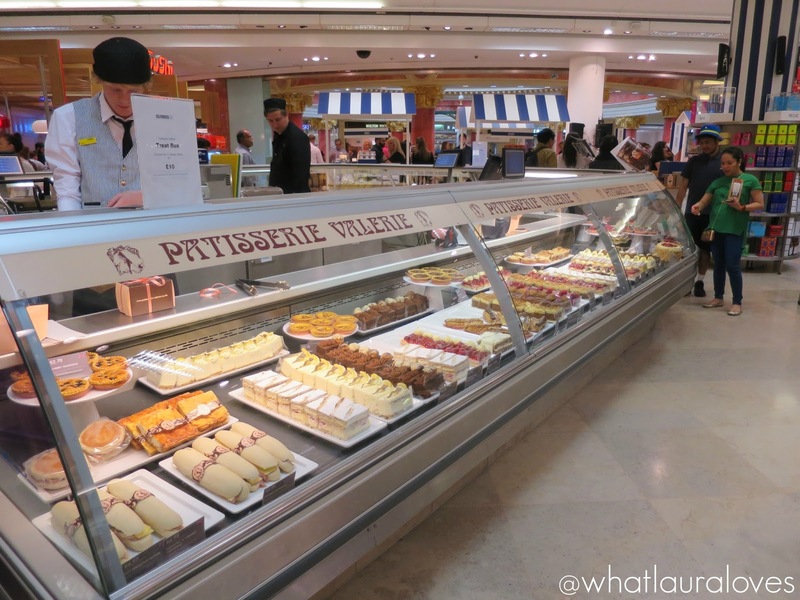 To be perfectly honest, I didn’t realise that they did this, I thought that the Foodhall would all be about the brand names like the amazing Patisserie Valerie that I’m used to only enjoying in London but it is also about the amazing artisans and local suppliers right on the doorstep of the store that are making delicious food with locally sourced ingredients. 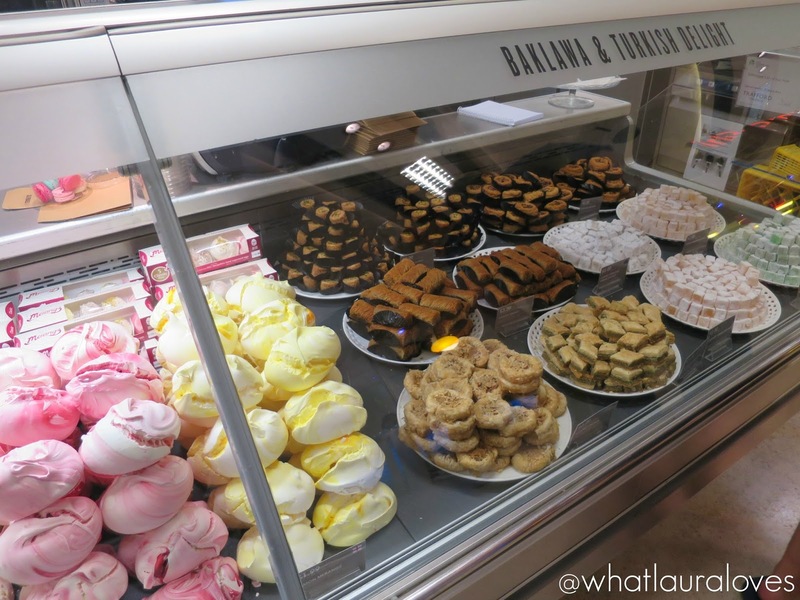 Not only is the Selfridges Foodhall full of delicious sweet treats but they have a great selection of takeaway cuisine too. There’s Itihaas who serve the most delicious looking Indian food and Colonial which is a fabulous pan asian street kitchen that I actually bought some food from to take home with me as my dad and I had a long drive home after the event and it would be far too late to start cooking by the time that we got home. We enjoyed barbecue pork buns, a Malaysian chicken curry, spicy noodles and a special fried rice. All of which tasted incredible and was devoured quickly after our drive back. If you live close to Selfridges at the Trafford Centre, I’d highly suggest picking up a meal next time you’re in. There’s so much choice, the food is packed full of flavour and far tastier than any ready meal you can buy and it heats up really well at home too. Plus, it is better than ordering a takeaway as you don’t have to wait for it to be delivered! 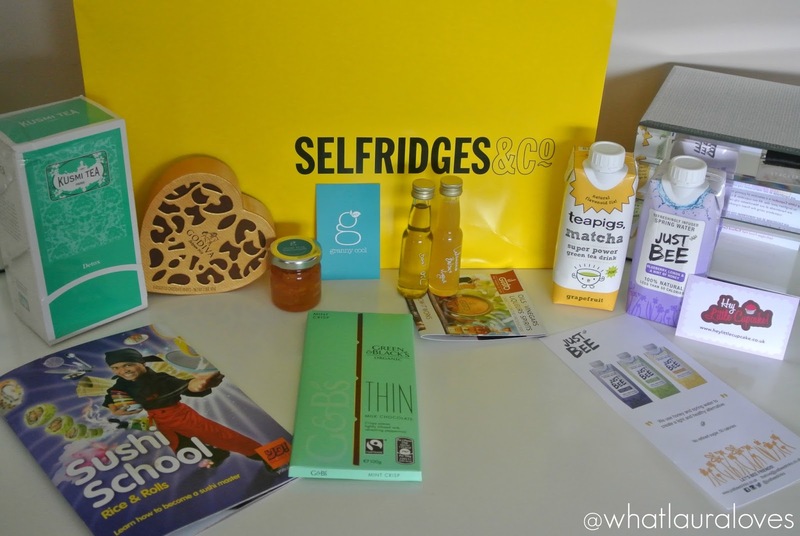 Not only did Selfridges showcase the best of their foodhall at the event but they also sent us all home with a fabulous goodie bag. It was packed full of lots of samples of products that you’re able to buy in store, from brands that I’m sure you’ll recognise such as chocolate makers Green & Black’s and Godiva to ones that you may not know, such as Granny Cool who produce preserves to Kusmi Tea. 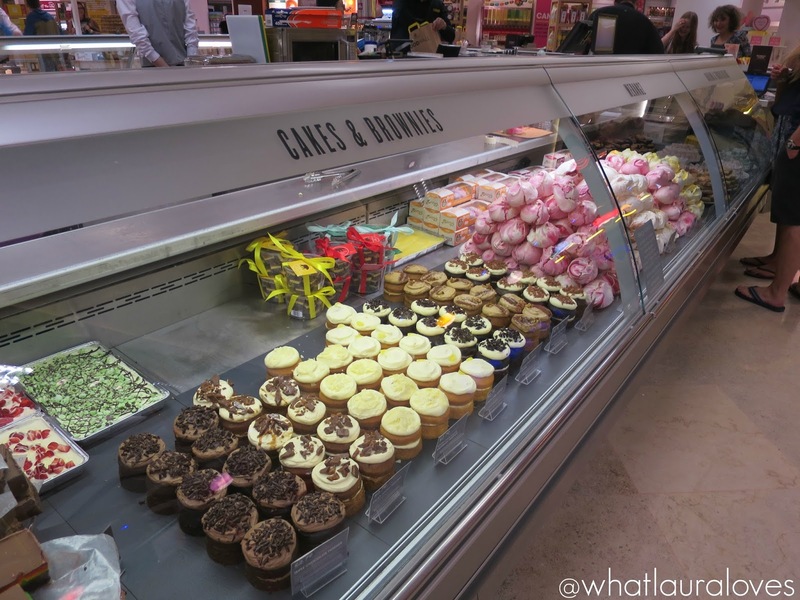 After visiting the Selfridges Foodhall at the event, I’ve really had my eyes opened to just how much variety they have available. In the past, I’ve literally popped in for a bottle of vodka or some American treats but now I’ll definitely be heading back to support the local artisans that stock their produce there and to pick the brains of the highly trained staff that know their stock inside out. 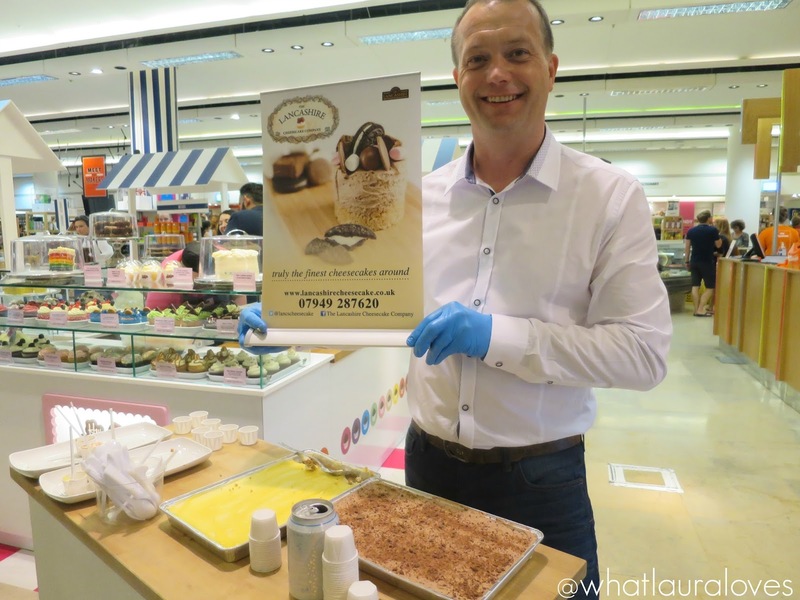 What is very apparent from the Selfridges Foodhall is that it is very much a one stop shop which is especially important at this time of the year with Christmas coming up. You can pop in to get a quick bite to eat or grab a coffee after a long day shopping, buy gifts for your family and friends and pick up a meal and a bottle of wine for dinner so that you’re not having to cook when you get back home. It really is fabulous! 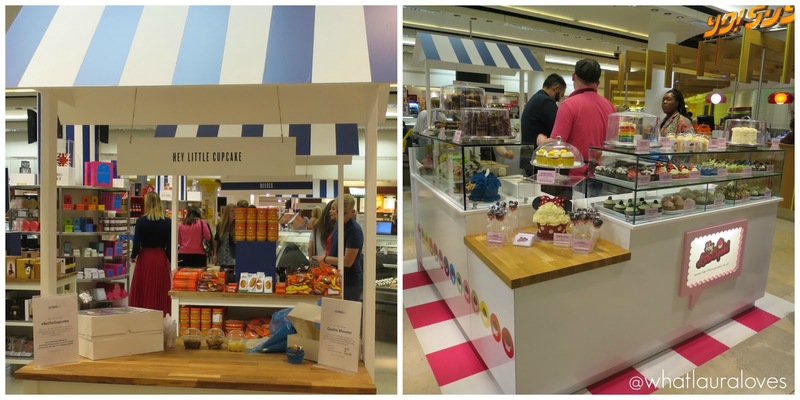 Each Selfridges store has its own Foodhall. You can find out all of the details about each store, including the Trafford Centre store here. 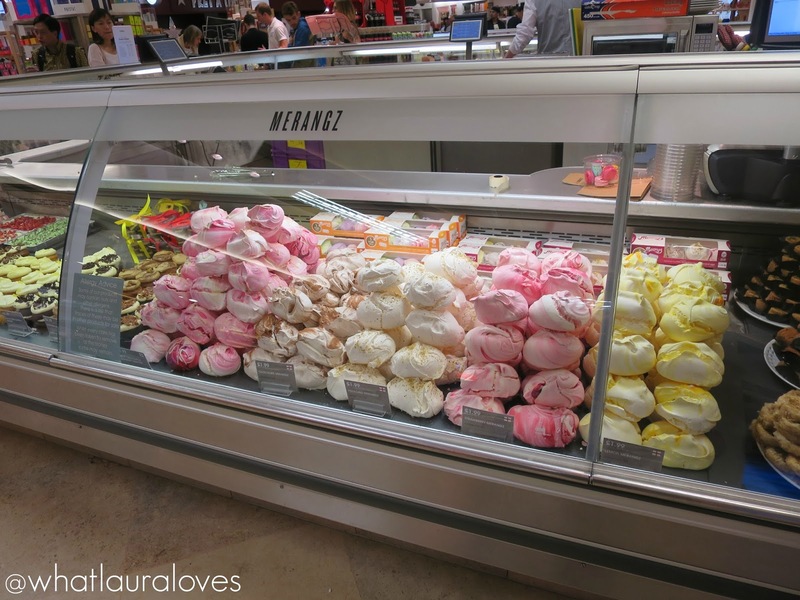 What would you love to buy the most from Selfridges Foodhall? I love Kripsy Creme they make the best doughnuts . This looks like an awesome event to attend! 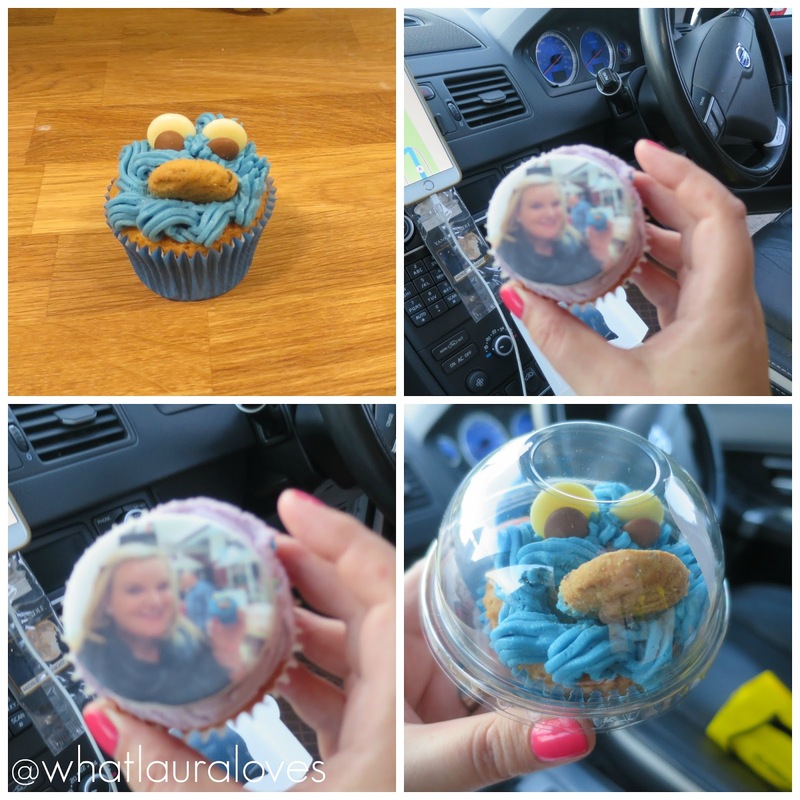 I'm a sucker for sweets, how cool is the cupcake with your pic though. I know you had a blast! Oh my God, I am so jealous! This looks like an awesome event! I love the photo printed on the cupcakes. What a great idea! Looks like you had a great time. This looks like such a great event! I am so jealous! I loved the photo printed on the cupcakes. Brilliant idea!